This is an amazing place to train. Very knowledgeable staff with battle tested experience, so you know the techniques work!! Whether you are there for a workout, basic self defense skills, or combat training, this place does it all. I recommend you try a class today, you won't regret. Stay vigilant and stay safe. Mike Rosati is one of the finest Martial Arts Instructors in NY! He teaches practical Martial Arts based on his extensive experience both in combat as a Marine, as well as a NYC SWAT Officer. Whether you're a Peace Officer or just a civilian looking to protect yourself, Smithtown Karate is the place to be. Not only will you be empowered with Reality Based Self Defense Techniques--You'll have FUN doing it! Sensei Kent is doing an Awesome Job! And, thank you to Instructors, Jason, Joe, Kishan, and my son, Christopher for a job well done helping Sensei Kent keeping Smithtown Krav Maga the # 1 School in Suffolk County! I can't say enough about the knowledge base at this facility. Everyone is friendly and inviting. Weather you are new or a seasoned veteran of martial arts, everything is explained with full detail. Great organization and even better instructors, this place helped me so much physically because I lost 70 lbs going here. It helped me even more mentally because it built my character and made me a more disciplined man, I am forever grateful for having taken smithtown Krav Maga. Hanshi Rosati is a VERY knowledgeable person and a great instructor! The clean environment and easy going nature of the staff here makes Rosati System of Modern Martial Arts - Smithtown Krav Maga a great place to learn REAL self defense strategies! I highly recommend this school and enjoyed the time I spent learning there during our Certification. Hanshi Rosati not only has the backing of a great Krav Maga system, but years of real life experience in law enforcement and the military making his instruction true to life and very valuable! I can't say enough good things about Rosati School of Martial Arts! I've been taking classes for a month and have already noticed a difference not only in my level of fitness but my self confidence as well. All the instructors are incredibly knowledgeable and eager to teach. Even though I had no prior martial arts experience, everyone was so welcoming and created such a friendly environment. As a former collegiate athlete, I was missing the intensity of training that I could not seem to replicate in the gym; Rosati School of Martial Arts has been exactly what I've been looking for to replace that gap I was missing from athletics. I would recommend this school to anyone! 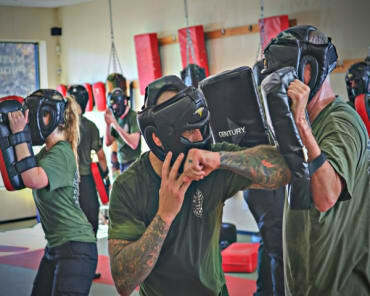 I will say that ive been to many martial arts schools and very few are as professional and inviting as Rosati Krav Maga. The owner of the school Hanshi is a true master of his craft and you'll be lucky to come across an instructor that is half as knowledgeable as him anywhere else. The school itself is meant for people of all skill levels. Everyone from instructor to student is willing to help you along your journey and all ego is left at the door. I really cant say enough great things about this school. My advice to anyone interested is to go down and take a look for yourself, I promise you wont regret it. The best thing I ever did for myself was to sign up at Rosati School of Martial Arts. The instructors are patient, inspiring, extremely knowledgeable, and have a good sense of humor. They could have easily seen me as a target, instead they see me as someone they can teach, and I always feel cared about and welcome there. No one laughs at anyone, this school only accepts good people who always help each other. If you've been wanting to try and learn self defense but were afraid to try for any reason, don't hesitate, this is the place for you. As I leave after each class, it feels so good to have learned from these AWESOME people. The world is a better place because of men like Hanshi Rosati and Sempai Chris. Rosati MMA is a family atmosphere that where the instructors are supportive to everyone's needs. The instructors ensure that all the students use proper techniques and they explain the importance of the technique for real world application. If you are looking for self-defense and fitness, Rosati MMA is for you!